If you called us up today and asked me how long I thought you’d need a wedding photographer for, one of the first questions I’d ask you is “what’s happening in the last hour of your wedding reception?”. 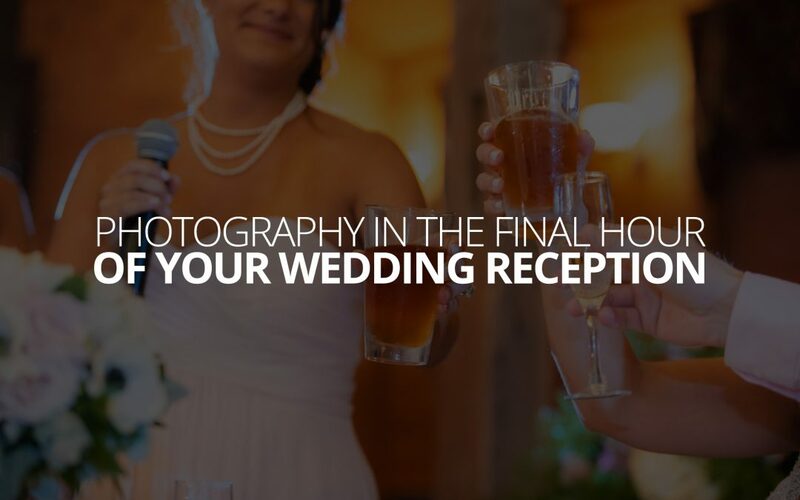 A lot of people wonder if they need a photographer to stay until the end of the reception—and some of them really do. But, a lot of them really don’t. And, I know from talking to these people that if you’re wondering this yourself, you might be feeling a little anxious about making the wrong decision, or even feeling kind of guilty about it. You can definitely relax. I’m going to validate the decision to skip the last hour of your reception if you want to. Let me be blunt: In virtually every wedding reception, a point comes in which the images start to become redundant. There are only so many meaningful variations of angles, and on so many different guests and family members and conversations, before they all start to blend together and lose their individual meaning. So, photographers naturally slow down, and begin to wait for increasingly unique moments to occur. And, those moments, in the context of a wedding and from the perspective of a documentarian, get increasingly far apart the further into a wedding reception you go. In other words, if you don’t really need a photographer there in the last hour of your wedding reception, but you have one anyway, the images they create in that hour are considerably more expensive than all the rest of the images from that day. Consider a wedding we photographed just a few months ago. Notice how the most images came from Hour 5 (the first hour of the reception), and the fewest images came from Hour 8 (the last hour of the reception). What was happening in that eighth hour? And were those 23 images distinctly or meaningfully different from the hundreds that came from the few reception hours before it? Well, no not really. However, in this case, the couple is glad to have them because 6 of those images came from their grand-exit, and having photos of that was a high priority for them. Ultimately, that couple made the choice that was correct for them, because they thought critically about what was going to happen in that last hour and how important it was to them to preserve it. 6 images were valuable enough to keep us there to the very end, but that might not be the case for you. Of course, every wedding is different, and priorities are always structured differently. So the questions remain for you, what’s happening in the last hour of your wedding reception? Will you do a grand-exit? Will you do a closing dance? Or honor a special guest? Will the lights turn down and the music up? Are these things you’ll regret not preserving? There’s no right or wrong answer here. Though, to offer my professional opinion, if you don’t have things planned in that last hour, then you can pretty safely cut that hour out entirely, or put it somewhere else (like during the preparations at the beginning of the day). In about 95% of weddings where we stay until the very end, the images from the last hour are nearly indistinguishable, thematically and aesthetically, from those created in the preceding hours of the reception. The odds are thoroughly in your favor, so you can either save some money or let us make more efficient use of the coverage. If you’d like to learn more about our wedding photography services, check out the Wedding Photography Page here on our website for more details! We’re looking foreword to hearing from you! You’re very right; It’s important for the couple to have their reception planned accordingly so they are aware of the photos they want and the ones that aren’t as needed.